I don't like explosions, tsunamis or any other dramatic clichés that people commonly use when describing mobile data growth predictions. From the jargon perspective, things will get worse as we approach the 5G era. But important questions remain: How much growth will there truly be, where it will come from and how will future networks handle it? According to this EU report, 5G is expected to bring 10–100 times higher user data rates and numbers of simultaneous connections per square km. It is also expected to bring 10–1000 times higher traffic volumes per square km. These predictions make me wonder about the nature of this growth. Is it exponential? It is following an S-curve? Are there limits to it? Are we closer to reaching them? As someone interested in using scientific methods to prove hypotheses and predictions, I chuckled while reading “When will Exponential Mobile Growth Stop?” The report’s authors imagined an extreme scenario in which all humans stream HD video on mobile devices for 16 hours a day, resulting in each person consuming 6 terabytes of data per month, and bringing global mobile data demand to about 30 zettabytes per month. My current mobile plan gives me 6 GB of data per month. To support 16 hours of daily consumption equivalent to HD video, I would need a plan that could provide 1000 times more data. I probably won’t need that much for 5G services (at least not soon). But how will mobile data plans and their pricing evolve as we move to 5G? How will radio, core and transport technologies scale to support 5G? Will they scale in an operator-friendly, consumer-friendly and cost-effective way? Can those numbers be right? Of course, we are not watching (and probably should never watch) HD video for 16 hours a day. The authors of the study did say that their report was a thought piece, and that they based their calculation on 2017 data and current technological capabilities, including those for video compression. However, the report provides a base for extrapolating this thinking in other growth directions that can lead us to similar (and similarly scary) results. For example, the world’s population is already approaching 7.5 billion. The UN expects this number to grow to almost 10 billion by 2050. That’s a lot of new humans to connect. The connected world is also expanding beyond humans to include connected beings such as pets, and other fauna and flora. We already use sensors to connect and track many animal species. This blog on precision agriculture shows how sensors can be used to gather important data on crop health and farm field conditions. Then there is the emerging world of connected things (IoT). Once it fully takes off, it will eclipse anything we know today in terms of numbers of connected devices. All these devices – and the applications and processes associated with them, many of which have yet to be invented – will generate, process, store and communicate incredible amounts of data. So what's all of this got to do with 5G? At times called a “system of systems,” 5G is a combination of many technologies that are evolving simultaneuosly and advancing in parallel. For 5G to make business sense and become a viable reality, these diverse network technologies and techniques must tame 5G data growth in a much more cost-effective way. We need to rethink the way we design, create and architect our networks to ensure that they can scale, be more flexible and allow automation. This rethinking must permeate across all domains of the future network: access (wireline and wireless), transport (optical, IP, wireless), services (core) and applications. It must also account for the fact that these domains will reside everywhere as cloud architectures become distributed and bring content closer to users and devices. Nokia has done this thinking and research, and has come up with a blueprint for the network of the future – the Future X network and 5G Future X Architecture. One very important and concrete step to bring this vision to reality was reimagining the chipsets, which manage and handle all this data processing. Earlier this year Nokia launched three new families of processors that will meet the changing needs for optical transport (Photonic Service Engine 3/ PSE-3), 5G radio (ReefShark) and IP networking (FP4 processor). 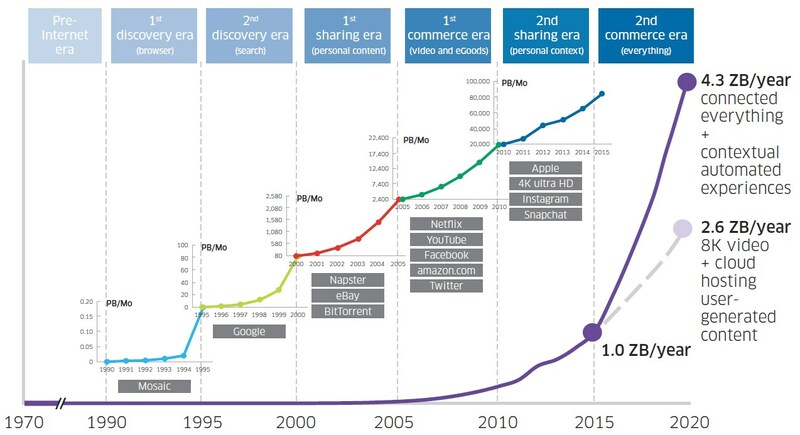 So, if you still need convincing about the data growth numbers, check out this short Bell Labs perspective on Future X for new understanding on how business, networks and humanity will be handling up to 10,000 digital interactions per person per day. It’s our vision for an intensely connected world. Alex is a telecommunications engineer voluntarily “planted” in IP product marketing team in Nokia (and loving it), and a firm 5G believer. To disconnect and recharge, Alex follows the lead of his whippets, practices the art of Tsundoku, and keeps the valves of his tube audio amps warm with jazz.